Watson suffered a fall recently and while the fall itself wasn't life threatening, it was discovered that he had a colon problem that was. His colon issue was much more serious than the fall itself and doctors transferred him to Wake Forest Baptist Medical Center in Winston-Salem, North Carolina where he underwent emergency surgery. The operation was initially considered successful however, Watson remained in critical condition for several days. Yesterday, the artist passed away at the hospital. Watson was born March 3, 1923 in Deep Gap, North Carolina and became blind due to an eye infection. His blindness since before his first birthday, was never a handicap to Doc. He learned to play the guitar and became such a genius with the instrument that his performances became legendary across many genres.. The eight time Grammy® award winner was the recipient of the National Medal of Arts and a National Heritage Fellowship. His family was musical and he grew up surrounded by the music he loved. His mother, Annie Watson, sang traditional secular and religious songs, and his father, General Watson, played the banjo, which was Doc’s first instrument as well. At age thirteen he taught himself the chords to “When the Roses Bloom in Dixieland” on a borrowed guitar, and his delighted father bought him a $12 Stella. Watson performed a variety of musical styles as well as being a songwriter and an inspiration to generations of new artists. While not just bluegrass, he was inducted into the International Bluegrass Music Association (IBMA) Hall of Fame in 2000 and the Society for the Preservation of Bluegrass Music in America (SPBGMA) in 1987 signifying the important role he played in the genre. "My real interest in music was the old 78 records and the sound of the music," Doc Watson is quoted as saying on the Folklore Productions website. "I loved it and began to realize that one of the main sounds on those old records I loved was the guitar." The bluegrass community has lost many other legends recently including Banjo Master, Earl Scruggs, Fiddler Kenny Baker, Americana artist Levon Helm, Jody Rainwater, and bluegrass pioneer Wade Mainer. The loss of Watson is an enormous loss to the music styles he played, including bluegrass. 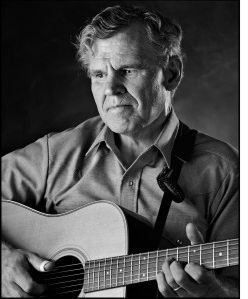 The site that was considered the authoritative outlet for Doc Watson has been posting his health updates and today, only has the Memoriam for Doc Watson.